Two babies, coolest hubs, limited time, minimal brain power. Coffee, travel, book, wine, beach, love addict. transformed water into vino, I’m sold. 2013?! um, WOW! Nate and I have now been married for 5 and a half years! We’re expecting our first BABY GIRL and we’ve just built and moved into our second home. Our passions include traveling, eating, laughing, and spending hours of time with family and friends. I’m really into working out, shopping, blogging is fun too but most importantly, living my best. I’m a high school teacher and Nate co-owns a recycling company called BluPlanet Recycling. 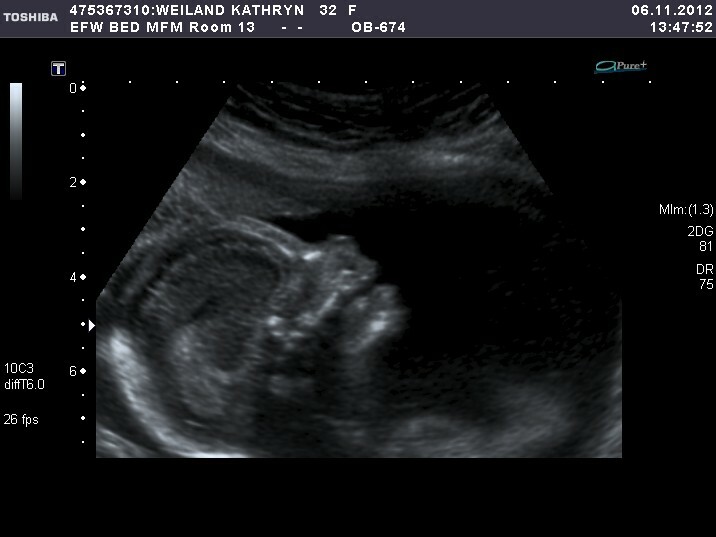 Check out our sweet BABY GIRL below. I can not wait to meet this little one. APRIL 6th is the due date! LOOK HOW SHE’S ALREADY SMILING!!! Her name will be revealed SOON!!!!!!!!!! It’s rad…just saying. And her name is: SCARLET LAURIE WEILAND <3 My parents call her Miss Scarlet and Nate and I have been throwing around the name Scarly. I know when she’s an edgy cool teenager she’ll probably love having the nickname Scar 😉 So fun! Laurie is after my amazing mother.